Sam HamillA 20 year old student at Bangor University is using his lifelong passion for marine biology to drive his ambitions to become the largest online livestock supplier of fish species in the UK. 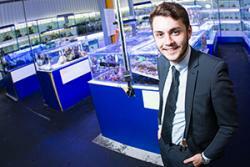 Sam Hamill, who is currently in his third year studying Marine Biology, is set to launch Big on Fish in November, an online shop and retail store selling aquarium equipment and stocking over 1,100 exotic fish and coral species. While Sam’s interest in marine biology began at the age of six, his entrepreneurial nature developed during his teenage years, when he set up his first business providing pond maintenance services to his local community at the age of 17. Once at university, and upon realising how competitive graduate jobs in the industry would be, Sam decided to set up his new business to develop and grow while balancing his ongoing studies. And following 18 months of hard work, next month Big on Fish is set to launch. Sam will manage both an online outlet which offers a next day delivery service based in Caernarfon, as well as a retail store in Manchester he has recently developed a partnership with. The shop will stock fish from across the world, including Hawaii, Australia and the Red Sea, with the most expensive fish species retailing at over £2,000. Sam is confident that both the retail store and online shop will enable Big on Fish to stock the largest number of fish species in the UK. He said: “It has taken time to build the business from the ground up to be ready to launch, but I’m a very ambitious person and felt this was a market that I could really add to with both my knowledge and passion for marine biology. During his business journey, Bangor University’s Enterprise Champion referred Sam to Big Ideas Wales, the support service for young entrepreneurs aged 5 to 25. Big Ideas Wales, which forms part of the Welsh Government’s Business Wales Service, and is part funded by the European Regional Development Fund, provides business support and mentoring for young people to enable them to make their business dreams a reality. To help craft his business plan, Sam attended Big Ideas Wales’ Bootcamp to Business event in Betws-y-Coed earlier this year. The three-day residential workshop played host to fifty young entrepreneurs with the aim of equipping them with the essential skills they need to help get their business ready and grow their network of connections. It was here that Sam received assurance and advice from mentors about his business plan, as well as meeting other likeminded young entrepreneurs, two of which he now rents a business space with in Caernarfon. And following the launch of Big on Fish, Sam has even more plans he is working towards making a reality. He has his sights set on opening further retail stores across the UK, with a store in his current home of north Wales being a key ambition for him, particularly with the marine biology work taking place in the region. And before the end of the year Sam also intends to launch a Big on Fish fish food product range, something that is currently in development in partnership with a company based overseas in America. The product will be imported from America which Sam can rebrand under the Big on Fish name, expanding the company’s offering to its customer base. If you've got an idea for a side hustle, click here to find out more. Big Ideas Wales is part of the Business Wales service to encourage youth entrepreneurship in Wales. Big Ideas Wales is funded by Welsh Government and the European Regional Development Fund and is aimed at anyone between the age of 5 and 25 who wants to develop a business idea. If you are interested in learning more about what the project can offer, sign up for Big Ideas Unleashed. You will gain access to the Simply Do Ideas platform to develop your Big Ideas, receive a free start up guide, be able to access support from a business advisor, and receive details of opportunities in your area. Sign up here. Article by Big Ideas Wales.